Brasil Hot 100 Airplay is the official music singles charts in Brazil. It has been compiled by Crowley Broadcast Analysis and published monthly by Billboard Brasil since the release of the magazine, in October 2009. Since April 2014, the Brazilian Billboard began publishing on its Brazilian site, the weekly Hot 100, as it is, and has always been held at the site, and Billboard magazine in other countries as well as the American Billboard. It is the top 100 songs, both national and international titles, the most varied genres, computed based on the total number of executions in the period indicated and the grid base stations Crowley, that monitors 256 radio stations located in the grid-base stations, made from Monday to Friday from 7 am to 7 pm. This grid includes the cities of São Paulo, Rio de Janeiro, Brasília, Campinas, Ribeirão Preto, Belo Horizonte, Curitiba, Porto Alegre, Recife, Salvador, Florianópolis, Fortaleza, Goiânia, Campo Grande, Cuiabá and the Triângulo Mineiro, Vale do Paraíba and Paulista Littoral mesoregions. The first song which reached in number-one on the chart was "Halo" by Beyoncé. "I Want to Know What Love Is" by Mariah Carey is the longest running number 1 (27 weeks), followed by Beyoncé's "Halo" (the most played song in the country, in 2009). ^ "Too 100 Billboard Brazil - Weekly". Billboard Brasil. April 2014. Archived from the original on 6 January 2015. Retrieved 30 April 2014. ^ Brazil Launches Monthly Magazine With Local Charts. Billboard.biz. Published by Nielsen Business Media, Inc. Retrieved 09-24-2009. Peter Gene Hernandez, known professionally as Bruno Mars, is an American singer-songwriter, multi-instrumentalist, record producer, and choreographer. Born and raised in Honolulu, Hawaii, by a family of musicians, Mars began making music at a young age and he graduated from high school and moved to Los Angeles to pursue a musical career. After being dropped by Motown Records, Mars signed a contract with Atlantic Records in 2009. In 2009, he co-founded the production team The Smeezingtons, responsible for the singles Nothin on You by B. o. B and he featured on the hooks for both singles, becoming recognized as a solo artist. His debut studio album Doo-Wops & Hooligans included the U. S. Billboard Hot 100 chart-topping singles Just the Way You Are and Grenade and his second album, Unorthodox Jukebox, peaked at number one in the United States. 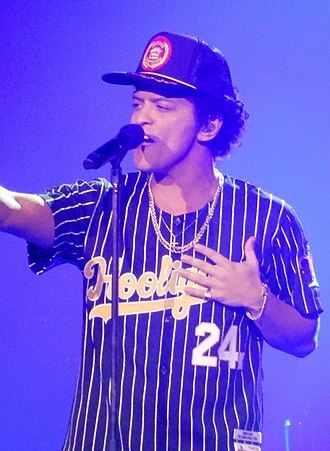 The album spawned the international singles Locked Out of Heaven, When I Was Your Man, in 2014, Mars lent his vocals to Mark Ronsons Uptown Funk. In 2016, he released his studio album 24K Magic with the lead single of the same title released on October 7,2016. To date, he has sold over 100 million singles and albums combined worldwide, Mars has landed six number-one singles on the Billboard Hot 100 since his career launched in 2010, attaining his first five faster than any male artist since Elvis Presley. Mars has received awards and nominations, including five Grammy Awards. In December 2013, he ranked number one on the Forbes 30 under 30 list, Mars is known for his stage performances and retro showmanship. 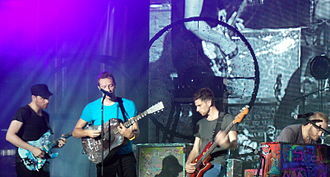 He is accompanied by his band, The Hooligans, who play a variety of such as electric guitar, piano, keyboards and horns. Mars performs in a range of musical styles. Peter Gene Hernandez was born on October 8,1985, in Honolulu, Hawaii to Peter Hernandez and Bernadette San Pedro Bayot and his father is of half Puerto Rican and half Ashkenazi Jewish descent, and is originally from Brooklyn, New York. His mother emigrated from the Philippines to Hawaii as a child, and was of Filipino and his parents met while performing in a show in which his mother was a hula dancer and his father played percussion. Belo Horizonte is the sixth largest city in Brazil, the thirteenth largest city in South America and the eighteenth largest city in the Americas. The metropolis is anchor to the Belo Horizonte metropolitan area, ranked as the third most populous area in Brazil. Belo Horizonte is the capital of the state of Minas Gerais and it is the first planned modern city in Brazil. 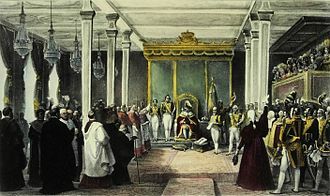 The region was first settled in the early 18th century, but the city as it is today was planned and constructed in the 1890s. The city features a mixture of contemporary and classical buildings, and is home to several modern Brazilian architectural icons, in planning the city, Aarão Reis and Francisco Bicalho sought inspiration in the urban planning of Washington, D. C. The city has employed notable programs in urban revitalization and food security, the city is built on several hills and is completely surrounded by mountains. 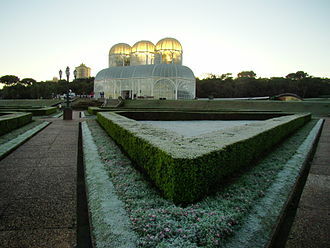 There are several parks in the immediate surroundings of Belo Horizonte. The Mangabeiras Park, located 6 km south-east from the city centre in the hills of Curral Ridge, has a view of the city. It has an area of 2.35 km2, of which 0.9 km2 is covered by the native forest, the Jambeiro Woods nature reserve extends over 912 hectares, with vegetation typical of the Atlantic forest. More than one hundred species of birds inhabit the reserve, as well as ten different species of mammals, Belo Horizonte was one of the host cities of the 1950 and the 2014 FIFA World Cup. Additionally, the city shared the host of the 2013 FIFA Confederations Cup, the term Grande BH denotes any of various definitions for the metropolitan area of Belo Horizonte. The legally defined Metropolitan Region of Belo Horizonte consists of 34 municipalities in total, the intense process of urbanization that is taking place in the metropolitan region has made some of the political boundaries between municipalities in the region obsolete. Belo Horizonte lies on a region of contact between different geological series of the Proterozoic, the geology largely comprises various crystalline rocks, which give rise to the varied morphology of the landscape. I Want to Know What Love Is is a power ballad by the British-American rock band Foreigner. It was released in November 1984 as the single from their fifth album. The song hit number-one in both the United Kingdom and the United States and is the groups biggest hit to date. 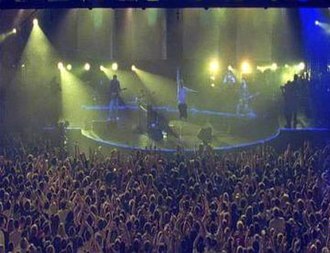 It remains one of the bands best known songs and most enduring hits, charting in the top 25 in 2000,2001. I Want to Know What Love Is has continued to garner critical acclaim, the song is featured in a number of films. 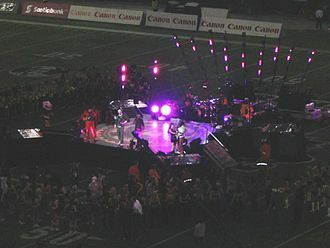 The choir appears in the music video. I Want to Know What Love Is reached #1 in the UK Singles Chart on January 15,1985, staying there for three weeks, and knocked Madonnas long-running Like a Virgin out of #1 on the Billboard Hot 100 on February 2,1985. It was Foreigners first and only pop chart topper in either country, although the band had four #1 Mainstream Rock hits and this was the bands third of four #1 singles on the Mainstream Rock chart. The song spent five weeks at #1 in Australia and hit the top of the charts in Canada, New Zealand and Sweden, peaking at #2 in Switzerland and South Africa. 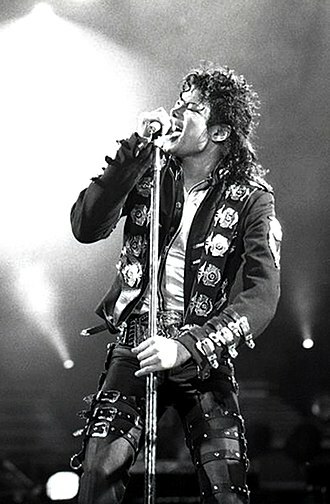 The song has received retrospective reviews from critics, with Bret Adams of AllMusic writing. Its dreamy, hypnotic feel is due in part to Lou Gramms soulful lead vocals, the song was issued as a 12 single with a longer time length of 6,23. This version contains a longer intro and an extended vocal chorus/fadeout ending. Soon after Foreigners single topped the charts, the New Jersey Mass Choir released its own similar-sounding version of the song on an album that it titled I Want to Know What Love Is. The choirs single peaked at #37 on the Hot Black Singles chart, the Foreigner song was ranked by Billboard as the #4 Billboard Hot 100 single of 1985. It was the bands third Platinum single in the U. S. and their first, originally consisting of three verses, a pre-chorus and a chorus, the song was extended with a bridge written by original songwriter Mick Jones specifically for Tina Arenas cover in 1998. In 1985, the New Jersey Mass Choir released the Prelude Records album entitled I Want to Know What Love Is. Dylan Kwabena Mills, better known by his stage name Dizzee Rascal, is an English hip hop recording artist and record producer. His music spans grime, UK garage, British hip hop, and R&B. Mills was born in London. His Nigerian father died when Rascal was young, and he was raised in Bow, London, in a single-parent family, by his Ghanaian mother Priscilla, about whom he says, I had issues as a kid. The way my mum helped was by finding me a different school every time I got kicked out and he attended a series of schools in East London and was expelled from four of them, including St Pauls Way Community School. He went to Langdon Park School in East London, reportedly, it was around this time that a teacher was the first to call him Rascal. Cagey about exactly what Rascals youthful madnesses entailed, in interviews he mentioned fighting with teachers, stealing cars. In the fifth school, he was excluded from all classes except music and he used to attend YATI. He was a friend of footballer Danny Shittu, whom he described as almost like a big brother. Unusually among his friends, he read the heavy metal magazine Kerrang. and was a fan of the grunge band Nirvana. Around the age of 14, Dizzee Rascal became a drum and bass DJ, MCing over tracks as customary in sound system culture. Aged 16, he self-produced his first single, I Luv U, in 2002, he jointly formed the Roll Deep Crew, a 13-piece garage collective, with former school friends. He signed a deal with the record label XL. During his early career, Dizzee worked with his mentor Wiley to create the still-unreleased song We Aint Having It and he made some instrumentals including Go and Ho and Streetfighter, which used some music from a video game. The set which features many seminal early grime artists was filmed, which was rare for the era, after winning a Sidewinder Award for Best Newcomer MC in 2002, Dizzee was a judge in the Sky1 show Must Be The Music. He did a verse on the Roll Deep remix of Lets Push Things Forward on the 2002 Weak Become Heroes CD and 12 single by The Streets. Dizzees first solo album, Boy in da Corner, was released to critical acclaim in August 2003. Panoramic photo of Center neighborhood. The Santa Elisa sugarcane processing plant, one of the largest and oldest in Brazil, is located near Ribeirão Preto. 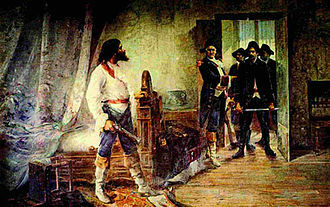 A group of Goianiense students from a public school. Federal University of Mato Grosso. Cultural Centre of Sesc in Cuiabá. Adele walking alone in Paris in the black-and-white music video for "Someone like You"
Adele performing "Someone like You" in 2011 during a concert in Seattle, Washington. Beyoncé, Bogart, and Tedder (pictured) composed "Halo" in Tedder's music studio in California. 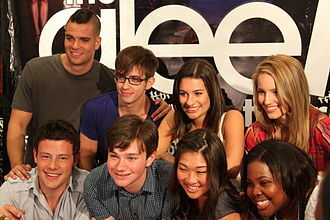 In 2009, members of the Glee cast performed a mash-up cover of "Halo" and "Walking on Sunshine".